Fashionable Heart: Renovations and Inspiration. I don't think I've ever made a post like this on here. First time for everything! I'm in the middle of redecorating my bathroom. I want it bright and girly, as it is the only room in our condo that is truly mine. I'll share a few pictures of some of the things I have purchased and tell you what I've done with each of them. :) After taking three hours to clean my bathroom up the other night, it really motivated me to organize it even more and just made me realize that it all needed a facelift. I'll try to remember to take a picture when it's all done. I already owned one set of these that I keep all of my hairbows in. I bought this second set to hold more of my hair things in the two larger tins. I have a lot of hair things! I use the little one to hold my eyeliners and lipliners. The big one is being used as my makeup tray. The medium one is storing my nail polishes, clippers, and other nail care items. And the round one is being used to hold my toothpaste, facial sponge, daily lotion, and other little things. The big one is being used to store my hair straightener and curling iron. The medium one is storing cough drops, medicine, etc. that would not fit into my medicine cabinet. And the small one is holding my makeup brushes. This is my new shower curtain. I got just a basic white liner to go with it. I wanted a simple shower curtain to draw attention to my new hot pink bath rug. I had to have these the minute I saw them! They are adorable! As for under the sink organization, I bought a pull-out tiered unit from Bed, Bath, and Beyond that I am using to store my bath gels, razors, etc. And I got a big shelving tray that I will be using to create more space under there. I have one on top of my bathroom counter that has created tons of room! 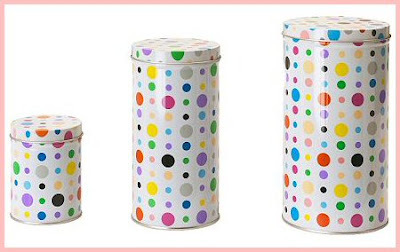 those are really cute tins. I need to get some kind of storage for all my stuff.